It is a local search site which caters to the ethnic taste and preference or identity of an individual. It allows people to search for a particular food place, clothes and lets ethnic business to find clients or customers. It is dedicated to catering to ethnic flavor, commerce and business and wants to connect like minded people. 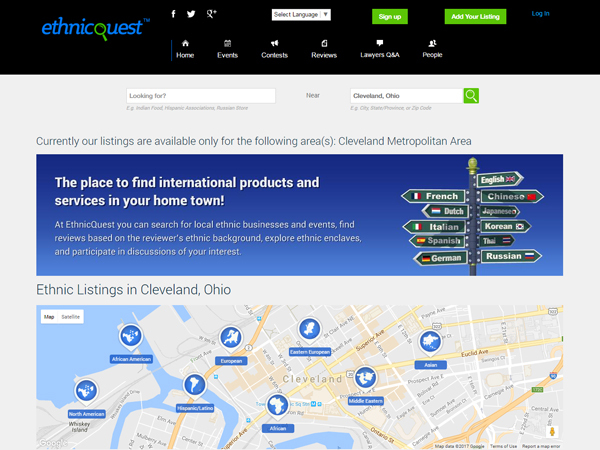 One can search and list results based on ethnic preferences, languages spoken, locations among others. The task was to build a comprehensive site which was an answer to every ethnic query. The test was to build a dynamic and attractive site which responded to any ethnic search input and listed the results in a meaningful manner. A site which allowed search and review options. A Drupal based website which was functional yet attractive, utilitarian yet effective, which allowed user interaction and had a space for client reviews. The site allowed search for events and businesses through their ethnic identity and to read reviews based on the identity of the reviewer. The entire site is built around the idea of an ethnic identity and its various manifestations as food places, events, restaurants, cloth stores, pubs and others.